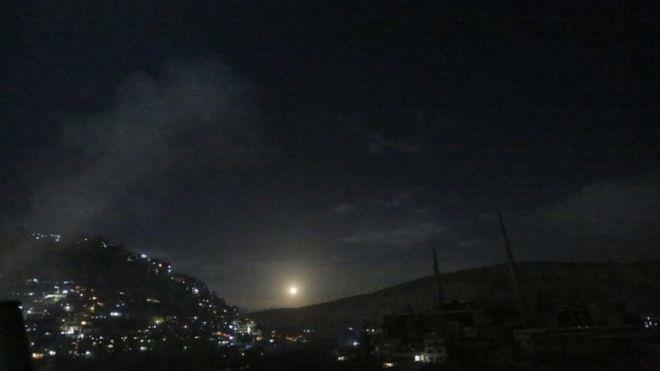 DAMASCUS, Jan. 21 (Xinhua) -- The Syrian air defenses responded to heavy Israeli strikes early Monday, destroying most of the missiles before they reached their targets, the Syrian state TV reported. The Israeli attacks were carried out from inside the Lebanese airspace and the Israeli-controlled territories in the Galilee, the state TV said, citing a Syrian military source. Xinhua reporters in Damascus saw the Syrian air defense missiles chasing targets in the sky over the capital coupled with sounds of explosions. The Israeli military said in a statement early Monday that it has started striking Iranian targets inside Syria and warned Syrian forces not to harm Israeli territories or forces. It is the second Israeli strike to target areas around the capital within 24 hours. On Sunday morning the Israelis fired missiles at Syrian positions, with the official media saying the attack was foiled by air defenses.